Wall plaque with an expansive encomium of a local man who, having amassed his fortune in a London trade, was brought back for burial in his native parish. It is unusual to find in a village church an expansive encomium of a local man who, having amassed his fortune in a London trade, was brought back for burial in his native parish. 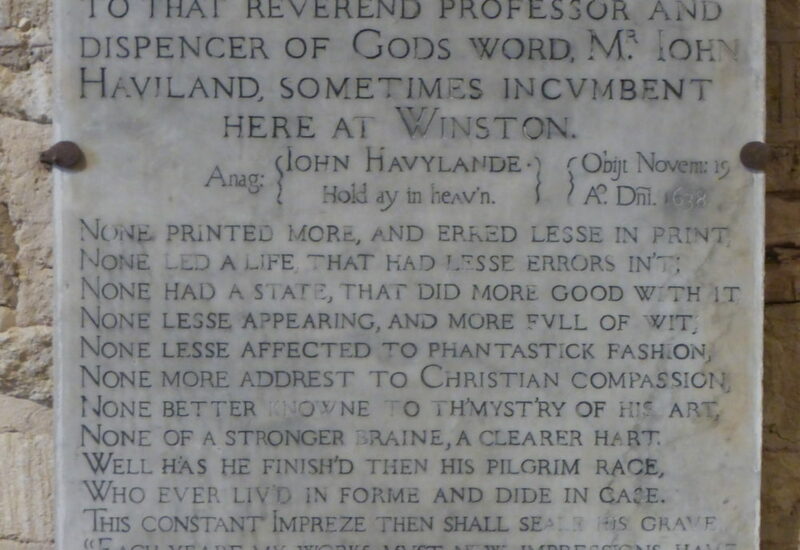 One exception is the tablet for John Haviland, Printer, at Winstone in the Gloucestershire Cotswolds. The memorial has prompted investigation of his business activities. 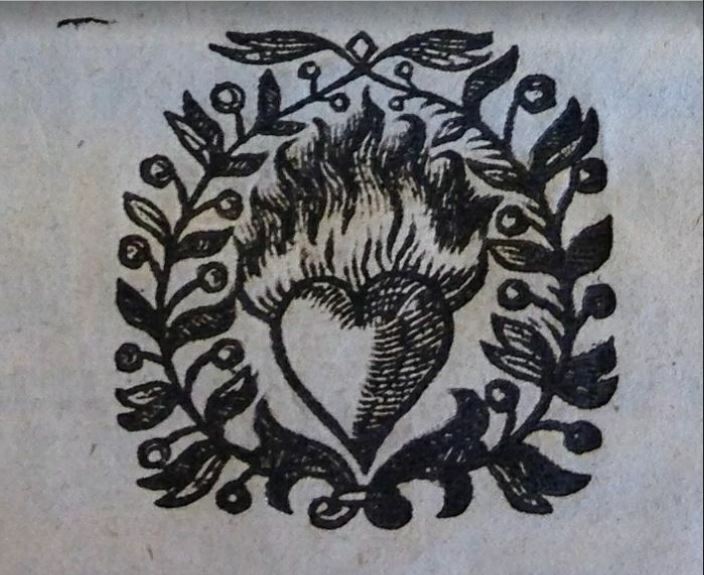 The findings are informative about printing during the early seventeenth century and equally enlightening about patronage and family ties but are not the moral tale the memorial’s author clearly intended. John Haviland was a son of a rector of Winstone who had acquired the parish through family connections. The rector was literate but neither Latinate nor a graduate; two of his sons were also literate. One went up to Oxford, as had the man who, having married the rector’s daughter, followed his father-in-law as incumbent. The family descended from merchants in Poole, Dorset, one of whose scions (b. 1555 and brother to the rector) had been apprenticed to a London printer before setting up in business. In 1606 he took on as apprentice his nephew, the John Haviland of the memorial. John subsequently entered business on his own account, printing in his lifetime 352 titles, including some by Francis Bacon. Printing was highly regulated although many printers evaded the restrictions, John Haviland and associates among them. Haviland was known to produce sub-standard copies with profit in mind. In 1634 the right to print Bibles came into the hands of what a modern author calls ‘that ruthless triumvirate’ of Miles Flesher, John Haviland and Robert Young, who thereby made a fortune. Haviland died before the age of 50, leaving assets reputedly worth £6,000. He was single and free to make bequests to numerous nieces and nephews, as to fellow printers. One of his associates and executors, John Wright, was charged with conveying the body back to Winstone. After that Haviland’s affairs lost all semblance of plain sailing. Much of the fortune was in the form of debts, which proved hard to recover. Additionally (given strict regulation at the time), it was unclear who might be entitled to take over the business. Legacies went unpaid. Legal disputes lasted 35 years and were never finally resolved. The Winstone plaque was no doubt composed earlier. It is a small slab of marble with inlaid black text – ‘nicely lettered’ says Pevsner – but with a few of the letters missing. For a time it was banished to the base of the tower but sixty years ago was returned to the nave, where it is clamped to the west wall. The text was carefully composed. Who wrote it? One guesses John Wright, who would have been able to extol Haviland’s literary skill. On the other hand the praise for John Haviland, the rector, may betoken some more local author, for whom the obvious guesses are the Printer’s graduate brother-in-law or a nephew. Further reading: Leslie Howsam, Cheap Bibles: Nineteenth-century Publishing and the British and Foreign Bible Society (Cambridge University Press, 2002 edition); P. McKay, ‘The Book of the Clerk’, Family History: The Journal of the Institute of Heraldic and Genealogical Studies, Vol. 20, No.s 167-174 (New Series 143-150), April 2001 to January 2003.